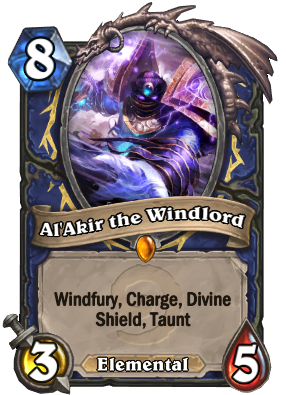 Al'Akir the Windlord was the Elemental Lord of air. He ruled over his domain of Skywall from his seat at the Throne of the Four Winds. He was once the foremost tactician in the Old Gods' horrific armies. Aligned with the corrupted Dragon Aspect Deathwing and his fellow Elemental Lord Ragnaros the Firelord in their efforts to usher in the end of days, Al'Akir was defeated by the mortal champions of Azeroth, who were able to enter Skywall from the breach in Uldum and destroy the Windlord within his own sanctum. Did you know that ( Al'Akir ) is an Arabic name and it's mean ( The Last One ) ? Makes sense to name him that since there haven't been any Windlords since him. After the rockbiter nerf this should have been changed to 7 mana. Still, a good, underrated card. "LIKE SWATTING INS- LIKE SWATTING INSECTS!" I feel like they should remove taunt on him (he only deals 3 to minions that attack him, which is nothing at turn 8 and further), and then buff him by lowering his mana cost and giving him overload, which I think would fit it as the shaman legendary, considering other classic set legendaries also often focus on something specific for that class (Choose effect for druid, enrage for warrior, powerful offensive spells for mage, etc.). It would also help making him combo with Rockbiter Weapon better again if it was 6 mana overload 2/3 for example, making him a solid late game finisher if you would not play him on turn 6 for tempo. Personally I never had a reason to include this one into any Shaman deck. But now because of Servant of Kalimos, there is a decent chance of discovering this one and then having Flametongue Totem already on board, Al'Akir the Windlord makes a decent choice for play. Biggest thing going for him is that you can use the other two mana to Rockbiter or Flametongue. Other than that, the keyword king himself isn't much more than a novelty. I can understand them not wanting to print a reasonably powerful charge/windfury minion because that could be a disaster, but then again Shaman is notorious for their disgusting burst damage. Al'Akir is basically Diet Doomhammer. Baron Rivendaire Ancestral Spirit Reincarnate shenanigans never get old! I got al'akir in my arena deck, and he has been closing games like crazy for me. I also swear he says "you f<*%[email protected] insect" on attack. Great card thumbs up. doesnt seem to bad to me mate! "Dust Needed For Remaining Cards: 5620"